~ All purchases include an email with PDF about essential oils in the blend(s) you’ve selected along with usage suggestions. : A synergistic herbal essential oils blend originally formulated for our Tai Chi teacher who had a very painful neuroma on her wrist. 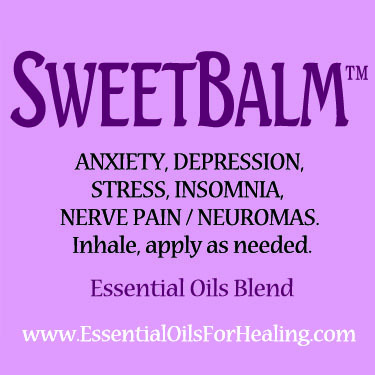 Sweet Balm™ Delightful and effective, is a pure undiluted, synergistic blend of 4 therapeutic flowering herb essential oils, including LAVENDER & GERANIUM. 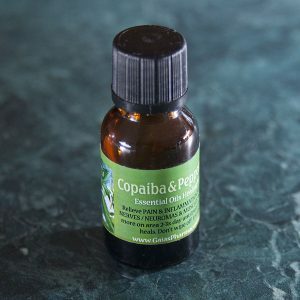 Traditionally known for healing & soothing nerves….and calming the emotions, it has a pleasant, refreshing aroma and relaxing, analgesic, nerve calming, healing properties. 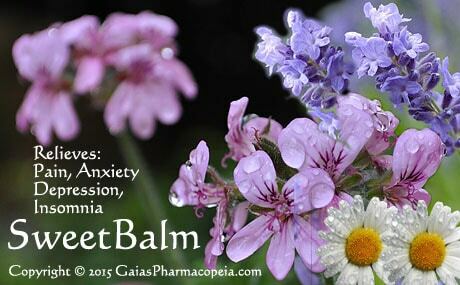 May help soothe ANXIETY, DEPRESSION, STRESS, INSOMNIA, chronic NEUROMAS and NERVE PAIN. We also do personal health consultations by phone & email, if you live at a distance. If you have a health issue and would like to use essential oils to support your well-being, give us a call or jot us an email. We enjoy working with our clients, one-on-one! • VISIT our Essential Oils For Healing blog! • READ more about pure essential oils’ therapeutic properties used in formulating our healing essential oil blends & all natural personal fragrances. 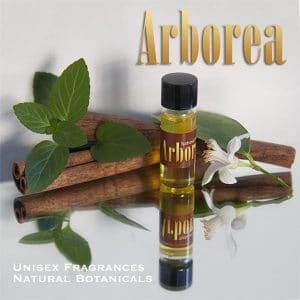 • LEARN about the benefits of Jojoba as a carrier oil. We appreciate knowing how these blends work for YOU. Every person’s health circumstances are different with individual preferences and responses, so results & experiences vary. 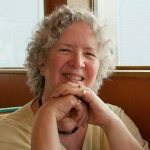 Researching and getting the ‘right’ combination of essential oils to aid an individual’s body in healing is a healing art, combining science with intuition. I keep records on the folks I’m able to assist, to learn from their experience, pattern of healing, etc. 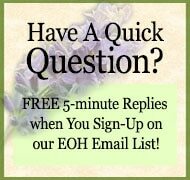 Please email me: Cynthe[at]EssentialOilsForHealing[dot]com with your experiences. Put several drops in the palm of your hand. Stir counter-clockwise 3 times with your fingers to energize the oils. Then apply per suggestions. Leave on, let absorb into skin. The essential oils and luxurious jojoba carrier will absorb completely after a minute or two without any oily residue. For NERVE PAIN: Apply 1-3 drops am/pm or more frequently as needed. For STRESS RELIEF: Simply inhale from the bottle deeply, as needed, for relaxation. OKAY to use if PREGNANT. For ACUTE Health crises use 100% undiluted essential oils. SOURCE: ISHA Clinical Aromatherapy Certification program. 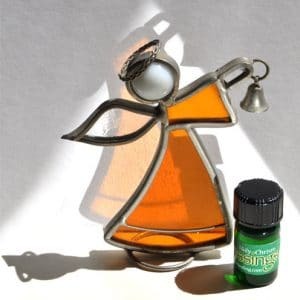 NOTES: Therapeutic essential oils ~ grown organically (or wild-crafted), processed carefully to retain maximum therapeutic benefits ~ are expensive (but have minimal negative side effects compared to conventional, toxifying pharmaceuticals). They’re very effective and powerful. A little goes a long way. [Had] a very painful, swollen wrist…[from] too much pressure exerted in an exercise. The severe burning [symptom] is associated with nerves [confirmed by my doctor as a neuroma], so Cynthe mixed [SweetBalm] essential oils designed to treat nerve pain. Realizing the pain originated further up the arm, I applied a drop just below the inside bend of the elbow continuing with one drop midway down the forearm, and another at the point of pain on the wrist. I massaged the entire are as deeply as possible. Besides easing the pain, a side benefit of this [SweetBalm] blend is its delightful fragrance. Deeply breathing in the wonderful aroma provides an extremely pleasant atmosphere for falling asleep.